For the Danish chess master, see Christian Poulsen (chess player). Christian Bjørnshøj Poulsen (born 28 February 1980) is a Danish former footballer. After starting his career with Holbæk, he played for a number of European clubs as a defensive midfielder, winning the Danish Superliga championship with F.C. Copenhagen, the German DFB-Ligapokal trophy with FC Schalke 04, and the European UEFA Cup with Spanish team Sevilla FC, later also playing for Italian Serie A club Juventus, as well as Premier League side, Liverpool, French side Evian, and Dutch side Ajax. He has been a regular member of the Denmark national football team since his debut in 2001, and has played 92 matches, scoring six goals for his country. He represented Denmark at the 2002 FIFA World Cup, 2010 FIFA World Cup and 2004 European Championship international tournaments. Poulsen was named 2001 Danish under-21 Player of the Year, and won the 2005 and 2006 Danish Player of the Year awards; the first to win two years in a row. Born in Asnæs, Poulsen started playing youth football in the local club Asnæs BK. However, he moved to amateur club Holbæk at the age of 15, where he made his senior debut at 17 years of age, captaining the side on several occasions. He was called up for the Danish under-19 football team in September 1998, and played four games for the team. In September 2000, he underwent a trial period for F.C. Copenhagen in the top-flight Danish Superliga championship, and signed his first professional contract with the club within a week. Poulsen took a commanding role in the attacking midfield of FCK, following the heart problems of former Norwegian international midfielder Ståle Solbakken in March 2001. Poulsen quickly made his mark on the league, and helped his club win the 2000–01 Superliga championship. He scored the 1–0 goal in the 3–1 win against second-placed Brøndby IF, which secured the league title. After the 2002 World Cup, Poulsen made a €7M move, the most expensive sale by a Danish club at the time, to German club Schalke 04, where he looked to take over the position as holding midfielder left by veteran Czech international Jiří Němec. His start in Schalke was made easier by the fact that his team mate in the Danish national team, Ebbe Sand, also played for the club. Through his time at Schalke, Poulsen played a number of matches at right back, but eventually secured himself a spot in the central midfield for both club and country. Poulsen was selected for the Danish squad at the 2004 European Championship. He played three of Denmark's four games, before Denmark was eliminated from the tournament. 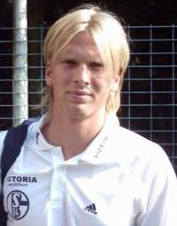 With Schalke, Poulsen won the 2005 DFB Ligapokal cup trophy. His displays for Schalke and the Danish national team earned him the 2005 Danish Player of the Year award. After four seasons with the club, which included well over 100 appearances, his contract expired in June 2006. Long-lasting rumours linked him to several teams, including Italian clubs Inter Milan and A.C. Milan. He eventually signed a contract with defending UEFA Cup champions Sevilla FC of Spain, the team that knocked Schalke out of the 2005–06 UEFA Cup tournament. In his debut match for the club, Poulsen helped Sevilla win the European Super Cup trophy, with a 3–0 victory against FC Barcelona on 25 August. Following his first month at the club, he was named the best new signing in Spain by Spanish sports daily Marca. He became the first player to be named Danish Player of the Year for two consecutive years, when he also won the 2006 award. He helped Sevilla defend the UEFA Cup title, winning the 2006–07 edition of the tournament and also won the Spanish Cup that year. On 14 July 2008, Juventus officially announced the acquisition of Poulsen from Sevilla FC. The transfer fee was €9.75M, with a four-year contract worth three million euros a year for Poulsen. On 8 February, Poulsen scored his first goal for Juventus against Catania in the 90th minute, earning a win for his team after the game was heading for a 1–1 draw. On 12 August 2010, Liverpool announced the signing of Poulsen on a three-year contract, for a fee of £4.5m. He was handed the number 28 shirt, previously worn by Damien Plessis. On 19 August 2010, Poulsen made his debut against Turkish team Trabzonspor in the Europa League, in a match won by Liverpool 1–0, in which he had a goal disallowed. Poulsen made his league debut for Liverpool in a 1–0 win against West Bromwich Albion on 29 August 2010. He did not, however, endear himself to the Liverpool fans who often found his performances on the pitch lacking in skill. On 20 November, he produced probably his best display in the centre of Liverpool's midfield against West Ham at Anfield, a game which the home side won 3–0. Following the sacking of Roy Hodgson, and the appointment of new manager Kenny Dalglish, the winds changed not only for Liverpool but also for Poulsen. Dalglish praised Poulsen's performances in the 1–2 defeat by Blackpool on 16 January 2011, the 3–0 win against Wolverhampton on 22 January 2011 as well as the 1–0 win against Fulham on 26 January 2011. Relatively soon after that, it did become clear that Dalglish preferred the young emerging midfielder Jay Spearing to Poulsen. On 30 August 2011, Liverpool agreed an undisclosed fee with Évian for Poulsen's transfer to the French Ligue 1 side. On 31 August 2011, the French side announced that Poulsen had signed a one-year deal. After his transfer in France, he became the second player in history after Florin Răducioiu to play in all five of the big leagues (Germany, Spain, Italy, England and France). On 22 August 2012, Poulsen signed a contract with Dutch club Ajax binding him with the club for two seasons until 30 June 2014, coming over as a free transfer from Évian Thonon Gaillard. Ajax acquired the defensive midfielder as a replacement for recently departed Vurnon Anita. During his first season in Amsterdam, Poulsen was a regular in the starting lineup, helping his side to secure their third consecutive national championship, and Christian's first in twelve years. On the 30 September, Poulsen signed a one-year contract with the Danish Club F.C. Copenhagen thus reuniting him with his former club, 12 years after he left them. On 14 May 2015, he set up the winning goal for Brandur Olsen in the Danish cup final as Copenhagen went on to beat F.C. Vestsjælland 3-2 after extra-time. He played his last competitive match in his career against Hobro on 7 June 2015. An aggressive, hard-working, and tactically versatile defensive midfielder, with good technique, Poulsen is known in particular for his tenacious tackling. Although he usually plays in a holding midfield role, he is also capable of being deployed in more advanced midfield positions. Poulsen playing in a 2010 World Cup qualifying game against Portugal. In the group stage of the 2004 European Championship, following the 0–0 draw with Italy, Danish television showed Poulsen being spat on by Italian playmaker Francesco Totti. Totti received a three-match ban and gave a "full public apology", after failing in his claim that he was provoked by Poulsen. Italy were subsequently eliminated from the tournament in the group stage. In the 2005–06 Champions League tournament, Poulsen's club Schalke played two games against Italian team A.C. Milan. Following their first match, a 2–2 draw, Poulsen was described as "a coward" by Milan coach Carlo Ancelotti, alleging that Poulsen physically kicked Milan's Brazilian playmaker Kaká. In the second match Schalke lost 2–3, despite a goal by Poulsen. Following the final whistle, Italian player Gennaro Gattuso steered towards Poulsen and confronted him. Gattuso made gloating taunts, while Poulsen gave him a sarcastic thumbs up, afterwards declaring he found Gattuso childish and hoped he felt embarrassed for himself. In the 89th minute of the UEFA Euro 2008 qualifier against Sweden, Sweden's Markus Rosenberg struck Poulsen, who in turn punched Rosenberg. After conferring with his assistant referee, referee Fandel sent off Poulsen and awarded Sweden a penalty, which was never taken as a fan ran onto the pitch trying to punch the referee. The Danish player Michael Gravgaard grabbed a hold of the fan but the referee abandoned the game. In the aftermath of the game, an angry fan attempted to press charges against Poulsen for punching Rosenberg. A member of the Copenhagen metropolitan police called for a month-long jail sentence, and Danish Minister of Justice Lene Espersen called for Poulsen's exclusion from the national team. The prosecution service rejected the case on 18 June, and national team coach Morten Olsen re-called Poulsen for the national team. See UEFA Euro 2008 qualifier fan attack for a list of other incidents in the controversial match between Sweden and Denmark. ^ "List of Players" (PDF). FIFA. Retrieved 8 November 2010. ^ "Player Profile: Christian Poulsen". Premier League. ^ a b "FCK prøver ung Nordvest-spiller". Jyllands-Posten (in Danish). 2 September 2000. ^ "Poulsen verstärkt den Pokalsieger". kicker online (in German). Olympia Verlag GmbH. 5 December 2001. Retrieved 7 August 2014. ^ "Daniel Agger skifter til Liverpool" (in Danish). Danmarks Radio. 11 January 2006. Archived from the original on 17 February 2006. Retrieved 31 December 2012. ^ Laudisa, Carlo (30 March 2006). "Milan, arriva Poulsen" (in Italian). La Gazzetta dello Sport. Retrieved 31 December 2012. ^ Rasmussen, Anders B. (21 September 2006). "Marca: Poulsens bedste indkøb" (in Danish). TV 2 (Denmark). Archived from the original on 12 March 2007. ^ "Christian Poulsen alla Juve" (in Italian). Juventus.it. 14 July 2008. Archived from the original on 17 September 2008. ^ "Poulsen joins the Reds". Liverpoolfc.tv. 12 August 2010. Archived from the original on 15 August 2010. Retrieved 1 September 2012. ^ "Christian Poulsen joins Liverpool from Juventus". BBC Sport. 11 August 2010. Retrieved 11 August 2010. ^ "Liverpool 1 – 0 Trabzonspor". BBC Sport. 19 August 2010. Retrieved 19 August 2010. ^ "Poulsen's Kopite aim". Liverpoolfc.tv. 23 November 2010. Archived from the original on 26 November 2010. Retrieved 1 September 2012. ^ "Dalglish roser Poulsen" (in Danish). Ekstrabladet.dk. 19 January 2011. Retrieved 1 September 2012. ^ "Dalglish roser Christian Poulsen" (in Danish). Sporten.dk. 22 January 2011. Retrieved 1 September 2012. ^ Brandt, Flemming (27 January 2011). "Dalglish roser udskældt Poulsen" (in Danish). Sporten.dk. Retrieved 1 September 2012. ^ "Reds agree terms with Evian TG". Liverpoolfc.tv. 30 August 2011. Archived from the original on 18 May 2012. Retrieved 1 September 2012. ^ "Poulsen, le dernier (gros) coup (FR)" (in French). Etgfc.com. Archived from the original on 26 May 2012. Retrieved 1 September 2012. ^ "Christian Poulsen præsenteret i Evian" (in Danish). DR Forside. 31 August 2011. Retrieved 31 December 2012. ^ Bandini, Paolo; Burnton, Simon (31 August 2011). "Transfer deadline day – part two". London: The Guardian (UK). Retrieved 31 August 2011. ^ "Liverpool Transfer News: Christian Poulsen to Ligue 1 Evian—Who Are Evian?". Bleacher Report. 31 August 2011. Retrieved 31 August 2011. ^ "Ajax haalt Deen Christian Poulsen als opvolger Anita". HLN. Retrieved 26 October 2011. ^ "Poulsen: "Laatste titel was met Kopenhagen"". Gola.com. Retrieved 26 October 2011. ^ "Løber ud ad bagdøren: Christian Poulsen stopper karrieren definitivt". Ekstrabladet. 29 December 2016. Retrieved 29 December 2016. ^ "Juventus completes Poulsen signing". The Globe and Mail. 14 July 2008. Retrieved 23 November 2015. ^ "Totti ban confirmed". BBC Sport. 18 June 2004. Retrieved 31 December 2012. ^ "ANCELOTTI FURIOUS AT POULSEN". Sporting Life. 13 September 2005. Archived from the original on 30 September 2007. ^ "AC Milan 3–2 Schalke: Giants stutter through". ESPN FC. 6 December 2005. Retrieved 31 December 2012. ^ "Poulsen: Gattuso opførte sig som et barn" (in Danish). Danmarks Radio. 6 December 2005. Rosenberg: "We are in a tussle inside the [Danish penalty] area, pulling and pushing each other. I am not completely innocent in the situation, because I also hit him a bit, but not as hard as he hits me. And what the referees see, is when he hits me"; Source: Helmer, Jesper (2 June 2007). "Rosenberg: Jeg slog også Poulsen". Nyhedsavisen (in Danish). Retrieved 6 June 2007. Poulsen: "I was involved in a tussle with the Swedish player, who I felt had provoked me twice. I saw red and I hit him"; Source: "Denmark-Sweden Euro tie abandoned". BBC Sport. 4 June 2007. Retrieved 9 June 2007. Copenhagen Post: "Denmark's Christian Poulsen started the fiasco in the match's final minutes when he punched Sweden's Markus Rosenberg in the stomach after Rosenberg apparently struck him in the face. The line judge saw only Poulsen's retaliation,"; Source: "The comeback that never was". Copenhagen Post. 4 June 2007. Retrieved 9 June 2007. Burlund, Martin (2 June 2007). "UEFA to decide on Denmark-Sweden abandonment". The Guardian. London. Retrieved 9 June 2007. ^ a b "Politikomissær: Poulsen bør sigtes for vold" (in Danish). Politiken. 4 June 2007. Archived from the original on 4 November 2007. Retrieved 29 March 2009. ^ a b "Christian Poulsen slipper for straffesag" (in Danish). Politiken. 18 June 2007. Retrieved 7 March 2010. ^ Berendt, Lars (2 October 2007). "Kenneth Perez tilbage på landsholdet" (in Danish). Danish Football Association. Retrieved 31 December 2012. ^ a b c d "C. Poulsen". Soccerway. Retrieved 23 November 2015. ^ "Juve pounce for determined Poulsen". UEFA.com. 14 July 2008. Retrieved 23 November 2015. ^ "DBU's Talentpris" (in Danish). DBU. Retrieved 23 November 2015. 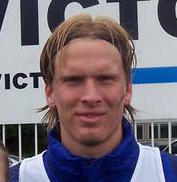 Wikimedia Commons has media related to Christian Poulsen.